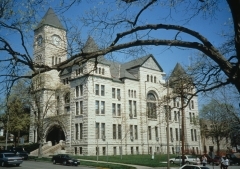 Designed by Kansas architect, George P. Washburn, the Romanesque-style Anderson County Courthouse was built in 1901. The rectangular, three-story structure is constructed of brick with a foundation of rough-hewn limestone. The rectangular plan is broken at the four corners by semicircular towers and a slightly projected entrance on the main facade. Limestone accents windows, trim, and entrance features. 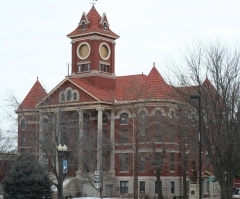 The courthouse was nominated for its local government history as well as its architectural significance. 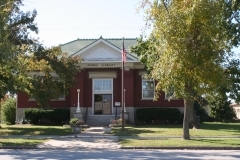 The Burlington Carnegie Free Library is an example of Neo-Classical architecture with its central pedimented entry and symmetrical facade. It was designed by George Washburn and Sons and constructed in 1912 by Louis Neblong. 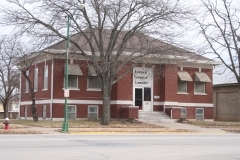 It was nominated as part of the "Carnegie Libraries of Kansas" multiple property listing for its association with the Carnegie Corporation Library Building program and its architecture. 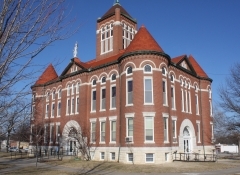 The Doniphan County Courthouse was designed by architect George P. Washburn and completed in 1906. 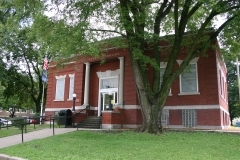 This structure is the fourth building to house the county courthouse. 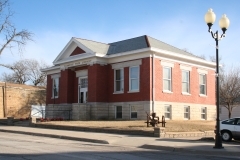 The first courthouse was outgrown by 1858, the second was destroyed by fire in March of 1867, and the third was outgrown and razed in 1905 to make room for the existing building. Located in downtown Troy on a courthouse square, the three-story Romanesque building contains a circular tower at each corner and a ten-sided cupola. 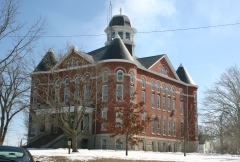 The base of the courthouse is native limestone while the remainder of the exterior is red brick. This building was nominated for its reflection of Romanesque architecture on a government building in Kansas. Architect: Boller Brothers; George Washburn; etc. 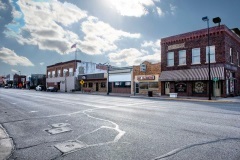 The El Dorado Downtown Historic District encompasses the heart of El Dorado's central business district, incorporating 111 properties along Main Street, the main north/south thoroughfare (U.S. 77), and Central Avenue (U.S. 54), the main east/west thoroughfare. El Dorado was platted in 1868 and incorporated in 1871, but serious development came later with the arrival of rail lines - the Atchison, Topeka & Santa Fe Railroad in 1877 and the St. Louis, Fort Scott & Wichita Railroad in 1883. The city’s early economy was tied entirely to its role as a railroad and trade center for the region’s thriving farming and ranching industries. 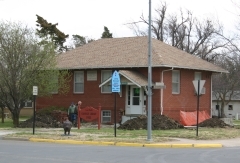 The discovery of oil near El Dorado in 1915 dramatically changed the downtown. The boom financed civic and infrastructure improvements and created new markets for downtown businesses. In 1939, the WPA Guide described El Dorado's business district as "a mixture of sturdy plain limestone buildings of pioneer days and ornate structures built during the oil boom." Today, the extant buildings interpret an array of historic uses and interpret the community's evolution from a railroad shipping point to an oil town to a mid-century auto-friendly business district. The El Dorado Downtown Historic District was nominated for its local significance in the areas of community planning and commerce.